Every bride has a different idea of what unique wedding centerpieces should look like. 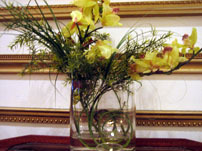 Some brides think a unique centerpiece would be a top hat filled with fresh or silk flowers. Other brides may think a unique arrangement would be a centerpiece that has a sports related theme, while other couples envision "unique" as a beautiful arrangement of pictures of them with their friends and family. I came across the below wine stopper rack and bottle stoppers at Bed Bath and Beyond and thought it would be a unique wedding centerpiece that could also function as your favor by purchasing a monogrammed wine stopper for each guest at the table. All your guests will be reminded of your beautiful wedding every time they use their bottle stopper. What makes this centerpiece unique is that it's a regular orchid plant but was decorated with shells and stones and other greenery around the bottom of the centerpiece giving it a very fresh look. I came across a peppermint topiary and thought you would consider making this type of table decoration for your reception. It’s easy to make, inexpensive and can be adapted to your color scheme and theme. Strong permanent adhesive, such as Beacon Fabri-Tac, which is quick drying, crystal clear and washable. It also bonds fabric, wood, leather, felt pearls, ribbons, and more. Red and white peppermint wrapped candies about 2 pounds. 1 yard each - of two different varieties of ribbon, 1 or 1 ½ inch wide. Use the Krylon primer to prime the pot and when dry, paint the pot to coordinate with your wedding pallet. Wrap the ribbon around the dowel at an angle to completely cover the dowel. Glue the ends and cut off the excess ribbon. Center the end of the dowel at one end of the Styrofoam ball. Firmly push the dowel into the ball however, do not push it all the way through. Once in place, glue the Styrofoam ball to the dowel. Glue the 5 inch ball into the pot. Use the glue dots to secure the candy into the 6 inch Styrofoam ball. Place the candies close together so none of the Styrofoam is exposed. Tie the ribbons in bows just under the top Styrofoam ball. Stuff the basket filler into the pot and cover the Styrofoam ball so only the filler shows. Using red and white peppermint candies and red and green ribbons will create a Christmas topiary centerpiece. However, changing the color of the wrapped candy, clay pot and ribbons will create a topiary for any theme. Not only will you have beautiful unique centerpieces, you will also have a table arrangement that your guests can enjoy eating during your reception. 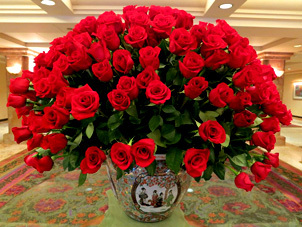 The above beautiful red rose centerpiece can be created for the bride who is not budget conscious. Notice the beautiful Asian pattern on the centerpiece holder. This centerpiece is a bit taller than I usually recommend for table ideas but it does work if you keep the container small and the roses cut to around 10 to 12 inches in height. The ideas on this page are quite different from one another. I hope you have enjoyed reading about them and come back for more tips on unique wedding centerpieces. Need advice? Check out this page.